Looking north toward Cape Lookout, Oregon, near the site of my SDR receiver recordings. Photo courtesy of Wikimedia Commons. In my original article 10 days ago, I set up a SWLing Post reader poll to let you give your opinion on which shortwave recordings within four pairs of audio files provided the most intelligible result. The recordings were intentionally noisy, low-level signals to help us discover–through critical listening to the files–if there is a clear favorite between the AirSpy HF+ or the Elad FDM-S2 receivers. Of course, there were only four pairs of recordings…not a very large sample size. Taken as a whole, no obvious winner emerged, although one might conclude the HF+ has a slight edge due to its lead in the “very close” recording pair of 7.230 MHz. One thing is clear–the AirSpy HF+ is a surprisingly good performer for its price of $199 USD! For many enthusiasts this will be all the SDR they need. As a final note, I’ll mention that the AirSpy HF+ used for the tests was totally stock. I have not yet performed the “R3 Bypass” mod nor the firmware update to my HF+ units. The simple R3 Bypass, discussed at length on the AirSpy Groups.io forum, significantly boosts sensitivity of the HF+ from longwave up to about 15 MHz, without any noted overload issues. For more on this modification from a MW DXer’s perspective, read Bjarne Mjelde’s insightful article at his Arctic DX Blog. Thank you to all the readers who took the time to listen to the SDR recordings in this comparision and register your opinions. This entry was posted in DX, DXpeditions, New Products, Radios, Recordings, Reviews, Shortwave Radio, Software Defined Radio, Uncategorized and tagged Airspy, Cape Lookout State Park, Comparing Radios, comparison, DX, DXpedition, ELAD, FDM-s2, HF, Oregon, Recording, Recordings on February 3, 2018 by Guy Atkins. In my recent post on the AirSpy HF+ vs Elad FDM-S2, I commented on medium wave reception only. This past weekend I swapped out the Wellbrook ALA1530S+ for another Wellbrook loop, the ALA1530LN Pro. This LN Pro model is less likely to overload receivers at my suburban Tacoma, WA location. Both AirSpy and Elad radios performed admirably with the LN Pro and it was nearly impossible to find any reception differences on medium wave. FDM-S2 with ALA1530S+ loop, medium wave: needs a minimum of 6 dB attenuation to avoid overloading. Anything less causes saturation of the spectrum & waterfall, “crunching” overload noises, and minimal or no received signal. HF+ with ALA1530S+ loop, medium wave: I had to search diligently to find any signs of false signals or overloading, but finally noticed a weak image or spur of a S-9+60 dB (-13.5 dBm) local station on 1560 that was appearing very weakly on 1270 kHz, mixing with the station on that frequency. Sometimes it was there, other times the spur or image would drop down and disappear, leaving the 1270 signal alone. If I added just 3 dB of attenuation in the antenna’s feed line, the interference from the 1560 station was gone for good. The S-9+60 dB station is a very strong signal; it’s impressive that the AirSpy HF+ deals with this and similar powerhouse signals so well. Long wave: Below are two screen captures from my local long wave reception in the evening, made moments apart with each receiver. As you can tell, there are a half dozen or so additional signals seen on the HF+ below 200 kHz that do not appear on the FDM-S2. These extra spikes are images or spurs from medium wave signals that were missing from the FDM-S2’s reception–bravo Elad! However, the remaining spikes on both radios below 200 kHz seemed to be noise or interference. Each receiver had roughly equal performance in the bulk of the long wave spectrum, when I did A-B comparisons on the same beacon signals. I’m not a LW or NDB DXer however, so I can’t claim any expertise on these frequencies. In short, though, both radios seem neck-and-neck from about 200 to 500 kHz. The DXer of LW frequencies may want to look elsewhere for a better performing radio than either the FDM-S2 or HF+. SWLing Post reader Tudor Vedeanu has commented that the SDRPlay RSP1A and the Eton E1 work very well at long wave. This entry was posted in Longwave, Mediumwave, Software Defined Radio, Uncategorized and tagged Airspy, ELAD, FDM-s2, HF, LF, long wave, Longwave, LW, Medium Wave, Mediumwave, MW, SDR on January 4, 2018 by Guy Atkins. The AirSpy HF+ is the new SDR on the block, but how does it compare to the Elad FDM-S2 which is more than 2-1/2 times its $199 price? My main interest is finding out how they compare in a very RF-quiet DXpedition setting, but today I compared the two briefly from my home in Puyallup, Washington (near Seattle). The receivers were connected via a two-way antenna splitter to the output of a Wellbrook ALA1530S+ loop antenna. I monitored during mid-afternoon local time to ensure that all my MW locals in my suburban location would be at full power, for the best test of the radios’ overload performance. The Wellbrook active antenna is rather “hot” and sometimes overloads receivers during the daytime unless attenuation is added to the signal chain. I noted there were no truly weak medium wave signals available during the session so comparing sensitivity wasn’t appropriate. However, the band was full of strong daytime MW signals. It became apparent quickly that the upstart HF+ provides strong competition to the Elad SDR. Clearly, the AirSpy’s trade-off is bandwidth for raw performance at lower cost–approx. 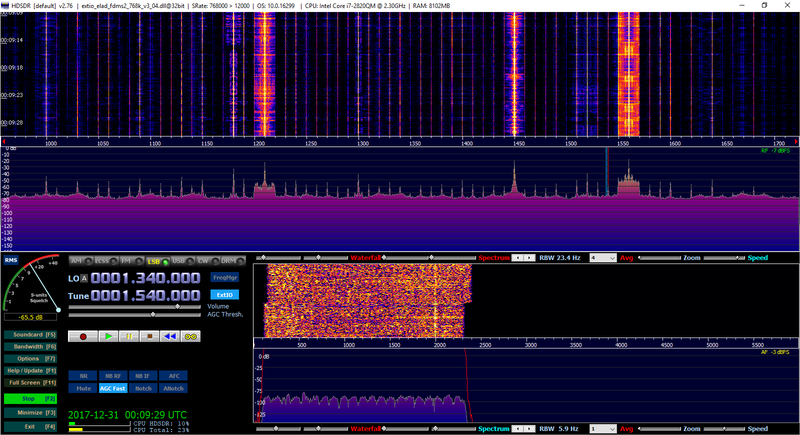 660 kHz alias-free coverage versus about 6 MHz maximum for the Elad. Using the same center L.O. (local oscillator) frequency, short recordings were made with both receivers on the same receive frequency, same bandwidth, AGC setting, etc. To approximate the 660 kHz coverage of the HF+, I set the FDM-S2 to its 768 kHz sampling rate, the closest available setting to 660 kHz wide coverage. This time the difference is subtle, but I think you’ll agree there is a greater amount of “crunchy” background distortion noise on the FDM-S2 recording. I found this to be the case in each instance where I compared receivers on frequencies adjacent to strong locals. I no longer own a Perseus SDR, but that receiver handles the entire MW band at this location without overload using the same Wellbrook ALA1530S+ loop. I’d like to emphasize that these were brief, somewhat casual AirSpy HF+ vs. Elad FDM-S2 tests. I expect that in a more forgiving RF environment, both receivers will be equally adept and digging out weak weak and challenging DX signals. I plan to investigate this very scenario in a few weeks at a quiet location on the Oregon coast. Side note: I have two HF+ units and they can operate concurrently without problems for full medium wave band coverage with HSDSR software, even when both are recording IQ WAV files. This entry was posted in Radios, Software Defined Radio, Uncategorized and tagged Airspy, comparison, ELAD, FDM-s2, HF, Review, SDR on December 31, 2017 by Guy Atkins. While browsing the Elad website, I noticed an End of Summer sale on their US retail page. The sale includes one of my favorite sub-$1000 SDRs–the Elad FDM-S2–priced at $499 US (originally $580). If you’ve been on the fence about purchasing the FDM-S2, this might be a good time to bite the bullet. Certainly a great value, in my book. Click here to read my review. Note that the Elad FDM-DUO stand-alone SDR transceiver and FDM-S1 receiver are also on sale. I don’t see an indication of when the sale ends, but I assume it may last until the end of summer. If interested, you might contact the Elad sales department to confirm. This entry was posted in Deals, News, Shortwave Radio, Software Defined Radio and tagged ELAD, Elad FDM-S2, Elad Sale, FDM-s2 on September 9, 2015 by Thomas. You can read more about Guy’s FDM-S2/HP Stream 7 setup in his previous post. This entry was posted in How To, News, Portable Radio, Shortwave Radio, Software Defined Radio, Travel and tagged ELAD, Elad FDM-S2, FDM-s2, Guy Atkins, HP Stream 7, HP Stream 7 tablet, Portable SDR, Software Defined Radio on December 9, 2014 by Thomas.